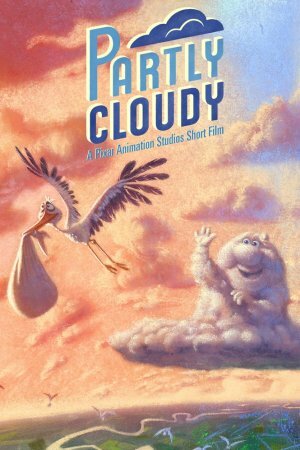 All day long, cheerful clouds in the sky make cute and cuddly babies, such as human boys and girls, kittens, puppies, and other creatures, and give them to storks for delivery to the expectant parents. 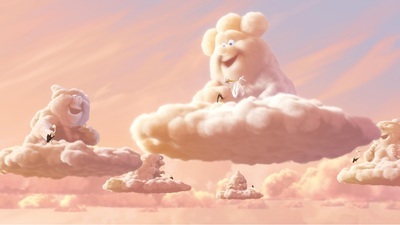 However, one lonely gray cloud named Gus has the task of creating animals that are cute but not so cuddly. His delivery stork, Peck, gets the worst of it, being bitten by a crocodile, butted by a bighorn sheep, and pricked by a porcupine. When Peck sees that his next delivery is a baby shark, he grows more than a little fearful and flies away. Feeling rejected, despondent, and angry, Gus unleashes a brief thunderstorm, then starts crying with rain pouring from below him. 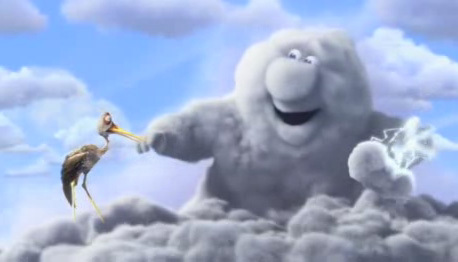 Peck, however, soon returns with a football helmet and shoulder pads, created for him by another cloud to keep him safe (alluded to in an earlier scene, where the same cloud creates a baby that would grow to love football). Gus instantly cheers up and gives Peck an electric eel to deliver, which shocks him despite the protective equipment; this time, though, Peck remains in good (but slightly frazzled) spirits. Create a description of the scene using similes, metaphors and personification. Write a conversation between two pink clouds talking about Gus the grey cloud or between two storks talking about Peck. Re-write the story as a straight forward narrative, adding in the feelings and dialogue between characters. Write a letter from Peck to Gus - asking him to change what he is creating. Write a letter of resignation from Peck to his boss, outlining all the problems he is having. Discuss the moral of the story, is there something about friendship here? Someone has to do the hard work. Rewrite the story changing the creatures that Gus creates. Change the narrative, perhaps Gus begins to create 'cute' creatures like the other clouds, what happens to animals like crocodiles then?